For thousands of years, yellow gold has been one of the most popular metals used for wedding or engagement bands. If you are naturally drawn toward traditional designs, you will fall in love with the 18k yellow gold men’s designer wedding band sandblasted to place a modern twist on a timeless classic. Comfort-fit wedding bands are crafted using extra metal, making them easier to squeeze over a large knuckle, so these styles are especially ideal for men. The men’s 18k sandblasted yellow gold designer wedding band features a uniquely finished center that is reminiscent of egg shells to add a dimensional layer to your overall look. The shining polished edges offer the perfect finishing touch to achieve a transitional vintage look with a contemporary update. At 18 carats in purity and quality, this designer wedding band contains approximately 75 percent gold and an alloy of copper, zinc, silver, or tin. The advantage to choosing the 18k yellow gold men’s designer wedding band sandblasted is the honeyed brilliance that cannot be beat by any other precious or alternative metal. Unlike many alternative metals, a precious metal such as gold can be resized and refinished many times. Rest assured that the wear and tear of everyday use will not have any effect on the enduring beauty of your ring. 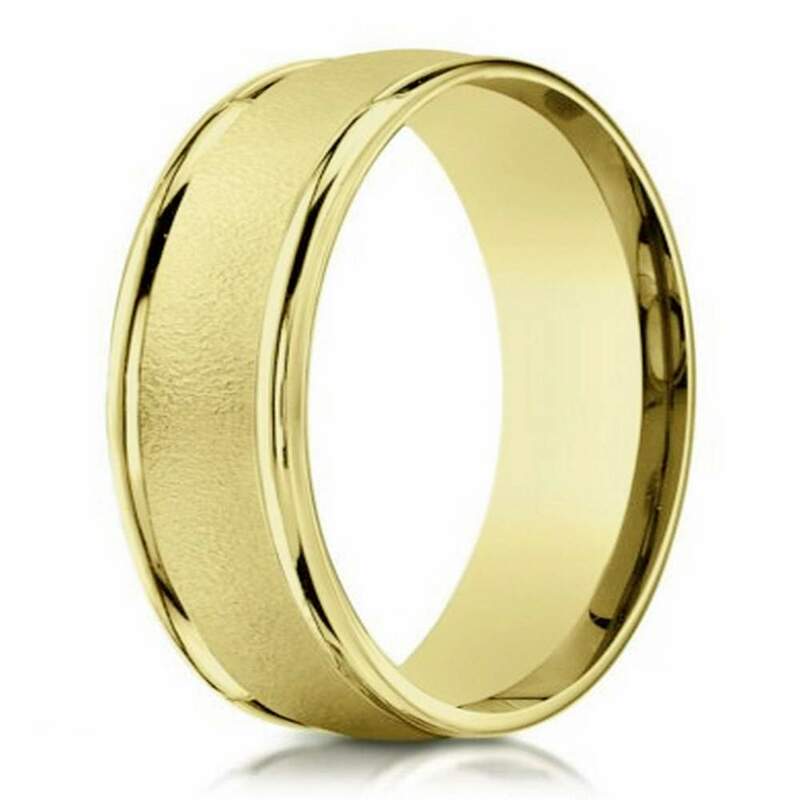 If you have any questions about our men’s 18k sandblasted yellow gold designer wedding band, please contact a member of the JustMensRings.com team today for further assistance.